As the Sun entered the 14th degree of Taurus, Edava Pathi began in right earnest. When I woke up at 0230 AM ( 28/05/2013), it was raining cats and dogs. The rains must have continued for one hour. It was accompanied by lightning. Let us hope that Global Warming has not triggered Climate Change to that extent and we will be receiving full rains ! Unlike the Gregorian Calendar, the Vedic Astro Calendar gives the positions of the celestial bodies. For instance, today is Edavam 15th and we know that the Sun is in the 15th degree of Taurus. Today the Calendar shows Thrikketta, which means that the Moon is in the constellation of Thrikketta and is in Scorpio. The Calender gives the Jnattuvelas and the Rohini Jnattuvela started on the 25th. So we are in Edava Pathi, in the midst of Rohini Jnattuvela. Rains will be sporadic but will accelerate asMakiryam, Thiruvathira, Punartham and Pooyam Jnattuvelas take over. Monsoons are caused by differential temperature between the land and the sea. The air on land becomes hot due to the overhead Sun and rises. Then the cool winds from the Ocean rush in to replace the hot air and it pours down as precipitation ! In June, Sun is almost at the Tropic of Cancer and northen part of the Indian subcontinent becomes very hot. During summer, the northern and central side of India and the Thar desert heat up considerably, causing a low pressure area over central and northern Indian subcontinent. The Indian Ocean sends moisture laden winds, to fill this void. These moisture rich winds move towards mighty Himalayas, creating wind blowing storm clouds towards the subcontinent. Himalayas block these winds from entering Central Asia, thus propelling them to rise. The clouds gain immense altitude, temperature drops sharply and thus precipitation occurs ! In Dec, Sun is almost at the Tropic of Capricorn ( 23 degrees 27 minutes south of the Equator ) and the Indian Ocean becomes hot and the northern land mass of India becomes cool. Hence winds rush from the cold North to the South . The cold winds blow from the northen subcontinent, sweeping down on the Himalayas and the Indo- Gangetic plains, towards the comparitively hot Indian Ocean. This is known as the North East Monsoon or rather the Retreating Monsoon and this causes Thula Varsham, the rains caused by the Sun’s ingress into sidereal Libra. These cold winds from the North pick up some moisture from the Bay of Bengal and rains hit Sri Lanka & India. Madras receives rains and 60% of the rains received by Tamil Nadu is from this monsoon. The Malabar Coast of 825 kms, stretching from Bombay in the North to Cape Comorin in the South, gets maximum annual rainfall. The three types of rainfalls, Kala Varsha, Tula Varsha and Venal Varsha grace this costal belt of Maharashtra, Goa, Karnataka and Kerala. The eastern parts of the Western Ghats do not get the SW Monsoon and hence places like Madras do not get its blessings. Madras gets the North East Monsoon in Oct-Nov, after Karkyadi ( when the Sun enters the first degree of Cancer ), when the Sun retreats South (Dakshinayana ), when the northern side of the Indian subcontinent becomes cool and the cool winds precipitate the North East Monsoon. Physiologists like Dr Walter Cannon ( The Wisdom of the Body ) talked about self regulating mechanisms or homeostatic control systems in the body physiologic. Arent these monsoons the homeostatic or self regulating control systems of Divine Nature ? The Western Calendar is based on the Tropical Zodiac ( from the First degree of Aries to the 360th degree of Pisces ) and we find that the Vernal Equinoctial Point recedes one degree every 72 years. ( This is the astro phenomenon of the Precession of the Equinoxes ) Hence in the Tropical Zodiac, the First Point of Aries moves ! 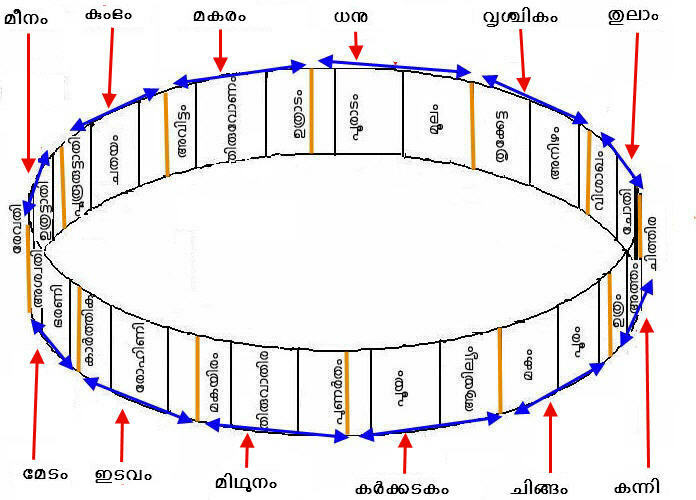 The Vedic Calendar is based on the Sidereal Zodiac and is counted from the First Degree of Beta Aries ( Aswini ) to the 360th degree of Zeta Piscium ( Revathi ). As the First Point of Aries moves in the Tropical Zodiac, some adjustments should be done in the Western Calendar. Pope Gregory modified the Julian Calendar by 12 days and the present Calendar came to be known after him - the Gregorian Calendar. Seasons were changing and Western astronomers were worried. So Pope Gregory added 12 more days to the Julian Calender ! Like, today is Oct 2nd and tomorrow is Oct 14th ! The Vedic Calendar, as it is based on the constellations of the fixed stars or rather the Sidereal Zodiac, is static and does not change. All Indian Astrology is Sidereal. So we find that, to the man of Wisdom, the Gregorian Calendar is of no use. The Vedic gives all astro information and is informative indeed ! 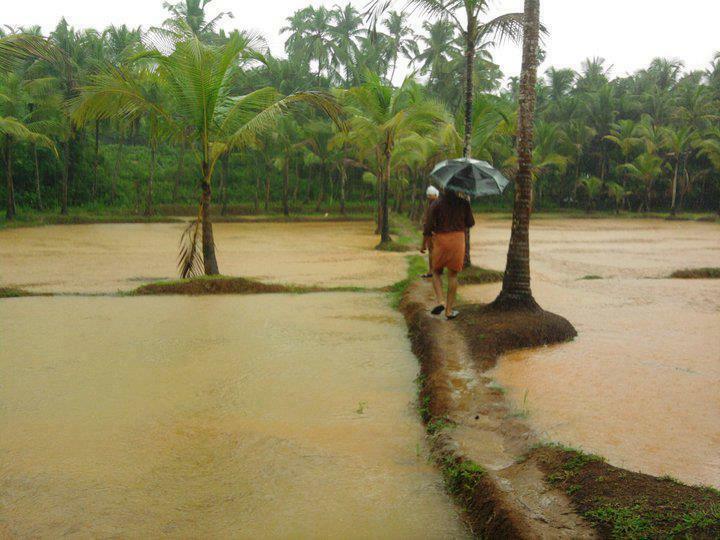 The Vedic Calendar was proved right again as it rained for 90 minutes here in Trichur, from 0300 AM onwards ( 31/05/2012). When I woke up at 3, it was raining cats and dogs of all descriptions. Even though Global Warming had triggered Climate Change, we can expect 100% of the rains. Even though rains are less, the V C says we will get rains and that sporadic rains will continue till November ! The Vedic Calendar gives the dates of the solar months from Mesha ( Aries ) to Meena ( Pisces ). It also gives the lunations from the First Lunation ( Prathama ) to the Last Lunation ( Amavasya ). It also gives the dates for the Hindu lunar months.